Not to be confused with the Austrian dance band of the same name, Edelweiss is an indie rock quintet from Stroudsburg, PA. In celebration of their Honduras EP, which drops next week, they played a gig last night at Tammany Hall. It was my first time in the venue, and I had a strange sense of déjà vu before I realized it used to be the Annex. It was also my first time seeing Edelweiss, and I didn't know exactly what to expect from the live show of a "math rock" band. Would they be standing there, feet planted firmly on the ground while their fingers did all the fancy fretwork to form the precise guitar lines? It turns out they were anything but stationary, a surging whirlwind of energy that swept up the audience. While it's true that the crowd started off small, as more people entered the venue, they didn't just talk to each other while waiting for the headliner. They said their hellos and then turned their undivided attention to the narrow stage, perhaps partly out of concern that one of the gambolling bandmembers might topple off. 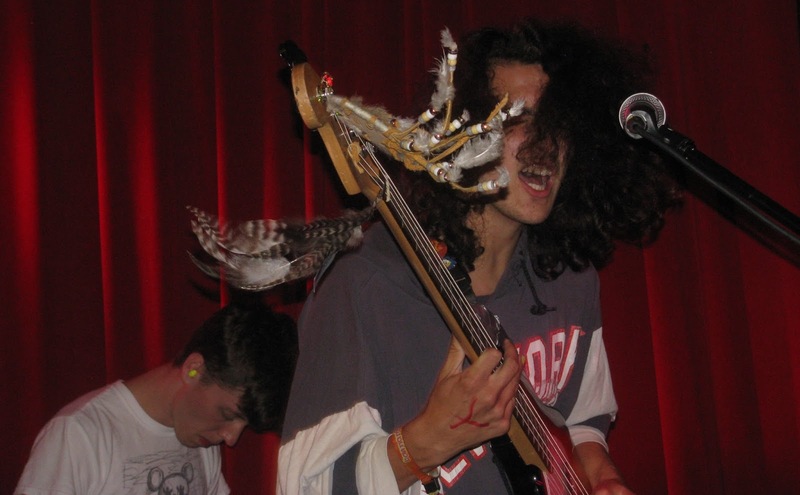 Bassist/vocalist Tommy Vitale was particularly engaging, with his wild bunch of curls catching the light like the web of feathers dangling from his headstock intend to catch dreams. Edelweiss started the set with "Grand" and "Withering Heights" from the new EP, not ashamed to front-load with fresh material. Self-describing their songs as either "fidgety" or "atmospheric," "Himura" was a nice mix of the two. Its jittery post-punk riffs concocted the feeling of an all-night dance party before opening up into a new dawn. Days don't last forever though, and the sun fell back behind the horizon, party time once more. The guys weren't slaves to technicality either, revealing some truly melodic moments in "Fiasco." The groove before "Icarus" was especially tasty, new fans cheering at its climax. The band finished the set with a medley of "A Sound from Pennsylvania" and "Toussaint," which escalated into a drum-led cacophony that even saw keyboardist Shane Cashman banging on a tom of his own. I interviewed the whole band for The Next Round podcast, so stay tuned in the upcoming weeks for that.